This resource guide is the result of many years of clinical social work practice and research with families, children, and youths affected by neurological illness. While much attention is paid to the person with ALS and their adult family member/caregivers, children and youths are often voiceless, despite experiencing much of the same shock, sadness, caregiving, and grief as their adult counterparts. 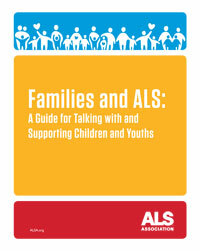 The resource guide was created primarily for families living with ALS, including parents, grandparents, siblings, and other family members. However, it was also created to support the many school-based and health care professionals who work with families affected by ALS. The goal of this guide is to help families start answering many of the questions that will be asked, as well as to offer support and suggestions for professionals assisting with families affected by ALS. A key theme throughout this guide is communication—how to do it, maintain it, and include it in everyday life. Based on subject matter-specific research, three books were developed for children and youth. Each book is presented to target the developmental stage of the youth. These materials have been developed as communication and educational tools to help inform medical providers as well as provide pertinent insurance and family information.